If you're in the market for a mechanical keyboard and want to keep the price below $100, Amazon currently has Corsair's Gaming K70 LUX on sale for $80, down from its regular price of $120. The sale price applies to the version with Cherry MX Brown key switches and red LED backlight. 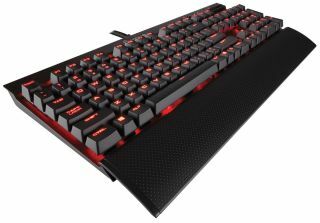 Corsair's Cherry MX Blue and Cherry MX Red models, both also with a red LED backlight, run a little higher on Amazon at $85 each. There's also a Cherry MX Red model with a blue LED backlight available for $80, though you might have to select the price from the "Others Sellers" section—it defaults to $96 even though one of the other sellers is Amazon. Go figure. Corsair's K70 LUX features an anodized brushed aluminum frame, large font keycaps, 100 percent anti-ghosting, and a detachable soft-touch wrist rest. You'll also find dedicated multimedia controls, textured FPS and MOBA keycaps, and a USB pass-through port. Go here to grab the K70 LUX.